As water softener installation becomes increasingly popular in Chicago, the question “Do I need a water softener?” is a common query on the lips of many existing clients and prospective customers of Johnson Water Conditioning Co. To follow are some insights that will provide you with the answer you seek. Just by virtue of living in the Great Lakes area, it’s almost certain that your home has hard water given the high quantity of minerals beneath cities like Auroraand Crystal Lake. According to the U.S. Geological Survey (USGS), 85% of Americans live in a “hard water zone”, and northern Illinois has some of the nation’s hardest water – regardless of whether your home is supplied by well water or a municipal water station. Stains on dishware, toilets, and sinks, a build-up of crud (calcium) around drains and faucets, and soap that refuses to lather are all signs of hard water’s presence. Along with wanting stain-free dishes and fixtures, every family desires fresh, healthy water for drinking, bathing, and cleaning – in other words, the kind of water that a water softener provides. Another important reason to install a water softener is that doing so can reduce your utility bill, since hard water creates deposits that over time will build up in pipes and reduce the efficiency of your home’s water flow. Moreover, untreated hard water and its resulting mineral build-up can also damage home appliances, lowering their lifespan and causing them to malfunction. 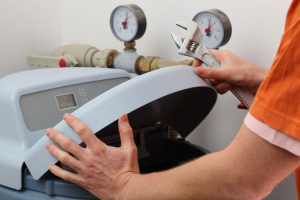 Another big issue is your water heater, where scale/mineral accumulation will inflate your water heating costs and eventually compromise the heater itself. Tankless water heaters are especially susceptible to hard water’s ills, and in some cases your warranty will be voided if you don’t pair a tankless water heater with a water softener. What exactly does a water softener do? Without getting too scientific, a water softener uses sodium and/or potassium ions to remove calcium and magnesium ions. Once this happens, the water softener flushes your water system of all excess ions and “recharges” your water with brand-new sodium ions. In this case, calcium and magnesium are bad, sodium (and potassium) are good, and a water softener is integral to introducing more sodium ions into your water supply. Even if your water’s hardness isn’t at an abysmal level, and even when accounting for a water softener’s “drawbacks” (upfront cost + regular maintenance, soft water’s “slippery” feel, and the need to apply water softener salt), Johnson Water Conditioning Co. believes the benefits to installing a water softener far outweigh the negatives. By installing a water softener, you and your family will enjoy “cleaner” showers (thanks to the lack of minerals and sediment in your water), healthier hair and skin, brighter clothing, more efficient appliances, less trouble with your water heater, shinier dishware and flatware, and, most importantly, water that is safer, tastier, and healthier to drink, clean with, and bathe in. If you have questions about water softener pricing, installation, or maintenance, contact our experienced team today.